The story of a Sci-Fi rescue of two friends from evil interplanetary forces by the Jupiter Train space shuttle. Energetic Latin & Jazz elements alternate with a soaring melody in the middle section. Commissioned for Sir John A. Macdonald High School Symphony, by the Ty-Mac Parents Association. Premiere: Ty-Mac Symphony Orchestra, Victor Davies, conductor, April 26 1990.
also Montreal Symphony Orchestra, Marc Fortier conductor. Recorded by Vancouver Youth Symphony Orchestra (own label); Arthur Polson, conductor. Suitable for high school, youth or community orchestra, professional pop concerts. Instrumentation: 3232/4331 /timp/2-3 perc/ keyboards/4 saxes (optional)/strings. 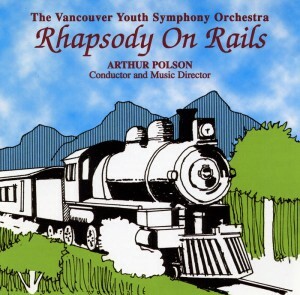 Music on CD Rhapsody On Rails, VYSO 2-1995.